In healthcare there are established normal values for many things. There’s a standard for blood pressure, normal cholesterol, and normal vision. It doesn’t mean that we expect everyone to have PERFECT measure, but there are healthy ranges for people depending on their age and situation. At Thrive Chiropractic, we are looking for a significant shift of the spine away from normal. 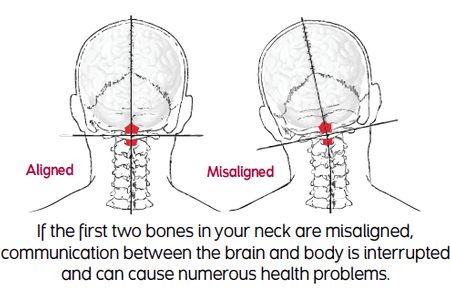 If the head and neck shifts in 3 directions it will cause the shoulders to twist, and the hips to shift forcing the entire spine out of alignment. These shifts will cause muscles to spasm, the ligaments to deform and disrupts NERVES traveling down the spinal cord. The primary condition that we work with is called Atlas Displacement Complex ​or commonly called atlas subluxation. What's the difference between Structural Chiropractic & Traditional Chiropractic?